Yesterday I wrote about questioning our practice with leveled books. Today I’ll continue those thoughts on using leveled books in my classroom. I love that we have leveled texts, I really do! It was a game changer when Matching Books to Readers was published in 1999. I spent a lot of time with that yellow book trying to understand the levels and how to best choose books for my guided reading groups that would accelerate the learning of my readers. Thankfully, teachers have a text gradient to help us choose texts to instruct children in small-group guided reading and in one-on-one conferences. But we can’t rely solely on a level. We have to make good decisions as a teacher – and we have to teach children how to make good decisions as a reader. I choose leveled books from our book room and from my own collection of leveled texts when I am teaching children in guided reading groups or conferring one-on-one. I use the level as a guide, and then look carefully at the texts and my teaching point to decide what book I will use in my instruction. I can’t just pull a level E book off the shelf because my reader is reading at a level E. I have to use that level as a guide and then make a good instructional decision as a teacher. For example, when a teacher knows that a student is reading at a level E, she also knows that at this level the child is expected to be able to rely much more on the print and less on the pictures, understand the punctuation marks, solve longer words, read sentences over 2-3 lines and over two pages and she knows how to choose a text that will support and challenge the reader who is ready for that. I write the level in pencil on the inside cover of my own books, and keep them organized in bins under my teaching table for me to use. I do not have a leveled books section in our class library. Our school book room books have the level on the cover, and if a child asks what that letter or number is for, I tell them, “It is a way to help me as a teacher organize and choose books. You don’t need to worry about the letters/numbers at all. It’s for teachers.” It’s important for me to always keep the focus on the book and not on the level. 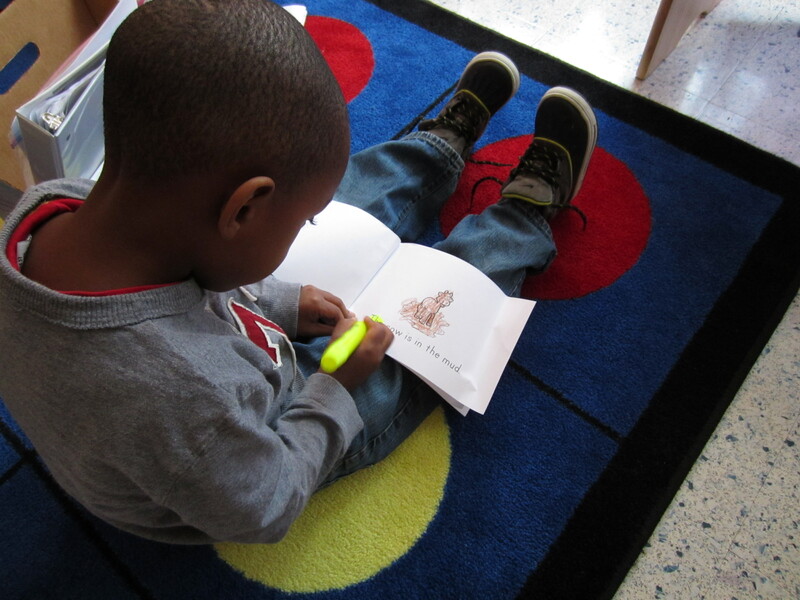 After a child reads with me, the leveled book goes in their book box. These books are kept in a large baggie inside the book box – which holds “just-right” books for my readers. I will often take several leveled books and display them for kids to choose from. I help them decide whether the book is a good match by talking through the book just like I would do when I am choosing a book. I look at the cover, leaf through the book, read the back cover, talk about the author or genre, read a page or two and look at the pictures. This is a great opportunity for teaching children how to choose books that are just-right for them. For example, if I have a child who is reading at a level E, I may take several books that are a range of levels from B-D, and are about topics I think the child will like, and then I invite the child to choose from that pile. I never mention the level. I simply say that I think he or she might like some of these books – let’s take a look and see if they are a good match. Keep in mind, my children also have 5-7 “look books” in their book boxes that are self-chosen from our classroom library and can be any book that child wants to read. 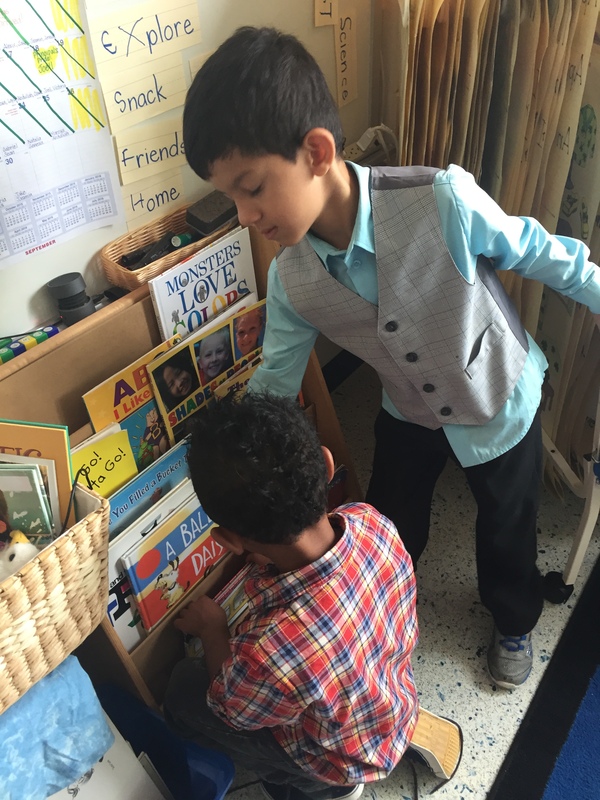 I often confer with readers in the class library – helping them decide whether books they are looking at are just-right books to go in their baggie, or look books that go in their book box. I will never tell a child that a book is too easy or too hard for them. I never want to discourage a child from picking up a book. I believe that it’s important to authentically teach children how to choose books and how to enjoy books. Choosing by level is not authentic and I fear that it creates dependent children who don’t know how to choose for themselves when a book is not leveled. At the same time, it’s extremely important to me that children have many just-right books to read at their fingertips. After all, that daily reading practice is how our readers are going to construct a reading processing system for themselves. But it’s also very important that children have books that are just plain fun – books they have chosen about snakes and tornadoes and Star Wars and dogs and princesses – regardless of the level. Because that’s how our children are going to get turned on to reading and love to read. And isn’t that what we want? I would love any thoughts on these posts. I realize this may make some people uncomfortable or unsure or questioning our practice. But isn’t that what we want to do as educators? I invite you to ask yourself, your team and your school “how are we using leveled texts, and why?” As Lucy Calkins wrote in my The Art of Teaching Writing book many years ago, “be brave enough to outgrow your own best teaching”. Questioning and challenging how levels are being used might be an area where we need to be brave. 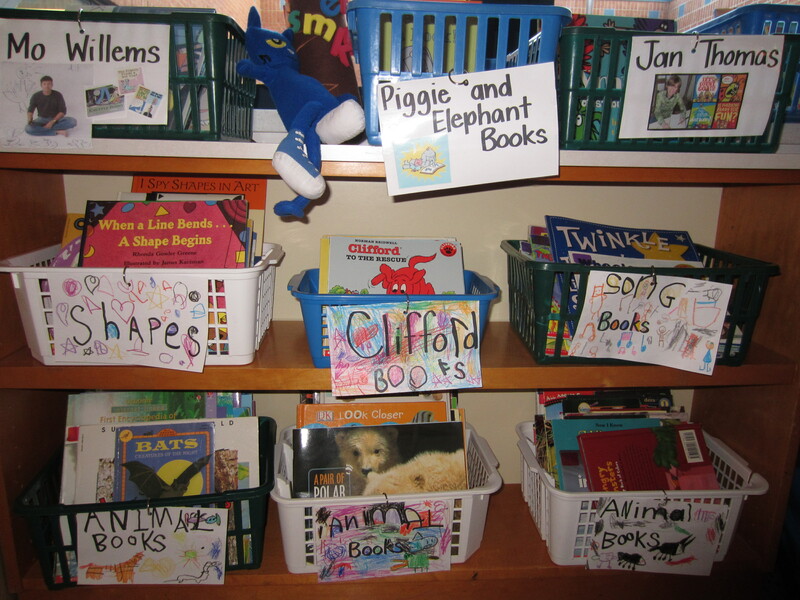 Many teachers use book boxes or book bags in their classrooms as a place for students to keep the books they are reading and to use during independent reading time. 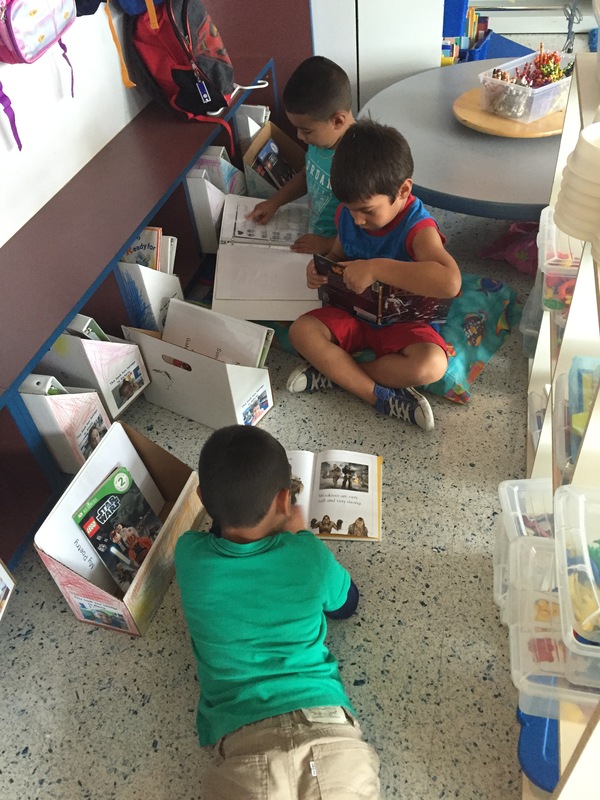 We like using the book boxes from Resources for Reading in our primary grades, because they are big enough for the oversized picture books that our readers enjoy. I have a baggie in each book box to keep students “just-right” books. At this point in our kindergarten class, the baggies include: ABC books created with the student, familiar shared reading poems and songs that we have read multiple times in class (copied and stapled into books), books created with the students using their names, predictable books created from class shared writing charts (I can write. I can draw. I can play Nintendo. etc…) and guided reading books. 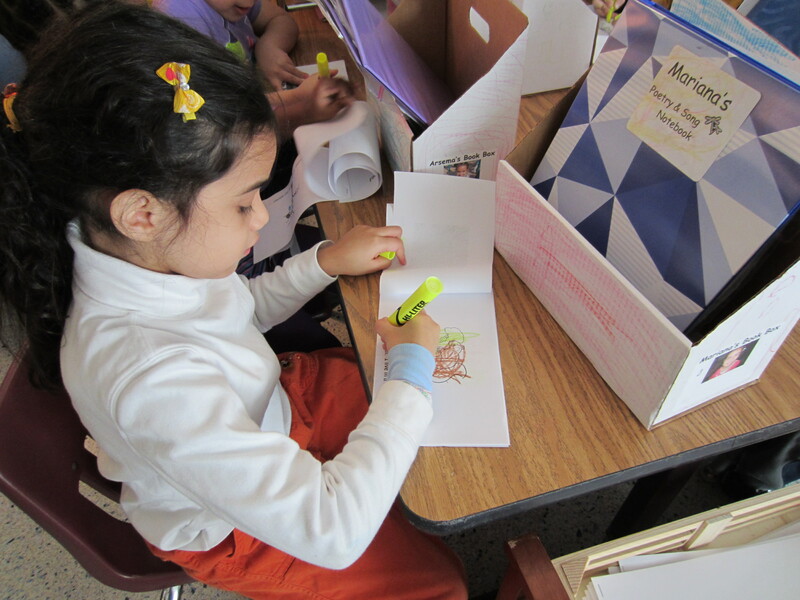 The book boxes also contain a Poetry Notebook where we add poems after we have read them all week during shared reading lessons. This is a 3-ring binder. I copy our new poem each week and we add it on Friday. Students illustrate the poem and take home the notebook every Friday to share with families. The Poetry Notebook is returned on Monday. (and yes, they are all returned – students LOVE reading from these all week, so they are really good about returning them) Students can also add 3-5 books from our classroom library as “look books”. These are favorites that have been read aloud or books that interest kids from our library. Students know they can read the pictures in these books, even if most of them can’t read the words. During shared reading I often use highlighter tape to highlight words we know from our word wall. The words that go on our word wall are high-frequency words that children are using a lot in writing and seeing in our shared reading texts. I also use the Fountas and Pinnell lists from their Phonics books to decide what words to focus on each week. We add 3 new words each week. We do a great deal of word work with our shared reading texts on large chart paper. These shared reading texts are put into student book baggies as paper mini books. During our book box independent reading time, students can get a highlighter pen and look for words they know from our word wall in the books from their baggies. (just the paper books!) I stress the importance of reading the book first, as I always want the focus to be on reading continuous text and making meaning from the reading. This activity allows the students to try this task on their own, in the books they are able to read from their book boxes. I model this very explicitly, as I don’t want it to turn into a “let’s color our book yellow” activity. Highlighters are a very fun tool for our young learners! We started with everyone finding one word from our word wall and highlighting it. The next time we looked for two specific words. After a few times of doing this whole group, I put out the highlighter pens and invited the children to do this for any of the word wall words during book box time. These paper books stay in the baggies for several weeks, and then I send them home for the kids to share with families. I sent home a sturdy freezer Ziploc bag with a label saying “Books I Can Read”. I tell the students to keep these books at home in a safe place and to continue reading them at home. For students who do not have a lot of books in their house, this provides one way to keep books available at all times. Using mini books and poems as shared reading texts and then putting these in book boxes has allowed everyone in the class to have a wide variety of texts they can read during independent reading time. There are many great places out there to look for mini books (see below for a list of some links) and of course, you can always create your own. My teammates are experts at creating books for our kinders to read based on the curriculum and what our interests are. 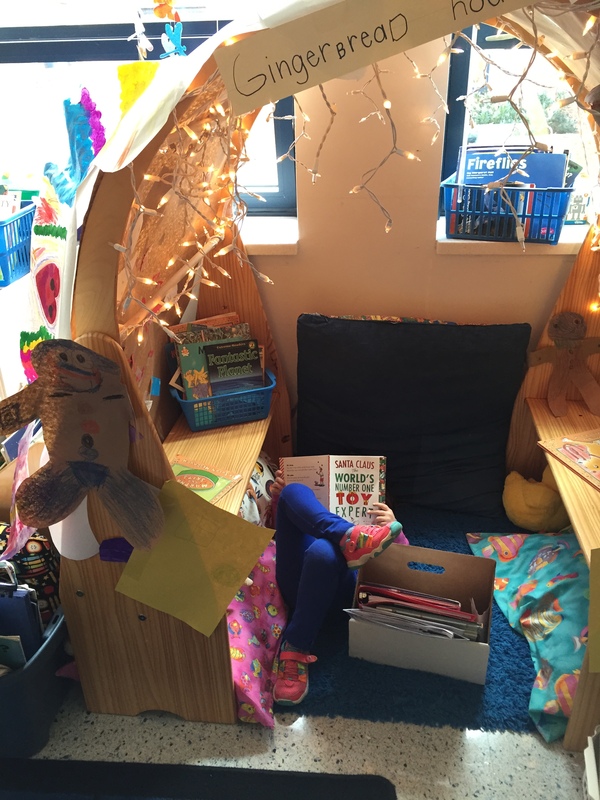 When the kids are engaged and interested during independent reading time, you’ll have a hard time getting them to put the book boxes away! How are you making sure your readers have lots of “just-right” texts at their fingertips?